The Takahashi EM-11 Temma 2Z equitorial mount is a German equitorial "GOTO" mount designed for loads up to 18.7 pounds. Designed for use in latitudes between 20 and 50 degrees, this superp mount has a look and feel that one expects from a Takahashi product. The mount features 144 tooth worm gears on both the right ascension and declination axis for precise slewing and tracking. The EM-11 T2Z operates off 12 VDC and is capable of GOTO operation from a PC or Mac, with a high speed slew rate of 150X, and slower manual slew rates for R.A. and Dec. adjustments. The mount features a built in, illuminated polar finder scope for accurate polar alignment, facilitating accurate tracking and GOTO's. To further enhance tracking capability, the mount is autoguider capable. 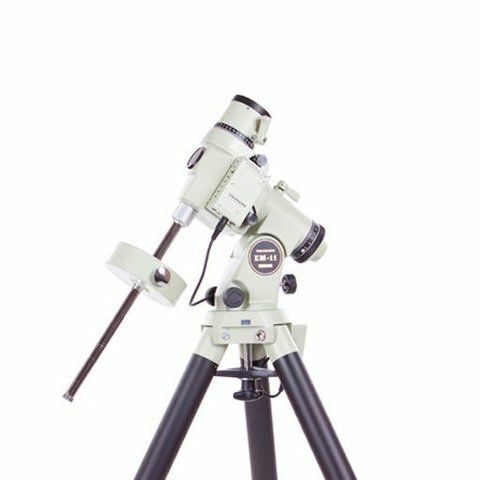 The mount comes equiped with manual scales for both right accension and declination, graduated at 10 minutes and 2 degrees, respectively. A 7.9 lb counter is included.